Most scientists and activists who understand the realities of anthropogenic global warming (AGW) have heard it repeatedly – climate scientists are wrong about global heating this time because they were wrong about global cooling in the 1970’s. Ignore for a moment the obvious logical fallacy here and focus instead on the claim that there was supposedly a scientific consensus in the 1970s that, due to global temperature data, the Earth was about to go into a new ice age. This claim by deniers is clearly verifiable, and that’s exactly what a team of researchers led by National Climatic Data Center climatologist Thomas C. Peterson has done. The team’s results revealed something surprising, given how widespread the “cooling consensus” claim is among climate skeptics and deniers: only 10% of related journal papers published between 1965 and 1979 supported a global cooling hypothesis – and 62% of papers supported the idea of global heating. According to the Science News article linked above, Peterson’s team found that the reason most AGW skeptics and deniers have latched onto the false “cooling consensus” meme is that the popular media at the time publicized it – Time, Newsweek, and the New York Times all ran articles on how the Earth was about to be plunged into a new ice age. Never mind that the first New York Times piece was corrected with two later articles. And the Science News story points out that the most commonly referenced paper for the “cooling consensus” myth was superseded by new data on how aerosols (thought to be the cause of the next ice age in the 1971 paper) weren’t in high enough concentration or distributed evenly enough around the planet to dramatically cool the Earth – and how new data on methane, CFCs, and other industrial chemicals were revealing those compounds to be greenhouse gases that have since been found to be contributing to AGW. Reuters reports that a new study starting this year will survey the Larsen C ice shelf in Antarctica to determine if it’s vulnerable to collapse. The Larsen A and B shelves collapsed in 1995 and 2002 respectively, leaving the Larsen C shelf arguably the most vulnerable ice shelf in Antarctica. While it’s a floating mass of ice and so its melting would have no direct effect on sea level rise, if it were to collapse too, that would uncork a number of fast moving glaciers on the Antarctic Peninsula. According to the article, the glaciers that feed the Larsen C shelf contain enough ice to raise the sea level by 8 – 12 inches. The scientists conducting the study hope to learn how fragile the Larsen C ice shelf is, and possibly some new information on why the Larsen A and B shelves collapsed previously. And they hope to learn whether the prior collapses were caused by global climate disruptions or by localized climate changes. According to a NYTimes article this past week, a new economic study out of the University of California – Berkeley shows that energy efficiency mandates implemented in the 1970s not only saved Californian’s billions of dollars, all that extra money enabled the state to create 1.46 million new jobs over the same period. The study examined household spending specifically, since such spending accounts for over 70% of gross state product (GSP), and it found that required energy efficiency improvements freed up money from energy expenses that was then spent on food, travel, and other goods and services. These alternate expenditures were found to also be in less energy-intensive economic sectors, further augmenting the initial energy efficiency improvements. Of course, not all of the sectors the study researched gained jobs – carbon-intensive energy sources and energy wasteful services naturally lost jobs, but the gain in other sectors more than compensated for the losses. The study also concluded that AB32, California’s recent climate law, would prove to be a “modest but positive” boost to the economy and that employment would rise by over 400,000 by 2020 as a result of the continued improvements in energy efficiency. California would have to ensure that those employees who lost their jobs due to being part of a high carbon or energy intensive sector were provided with retraining, but this is normal for an economy as it transitions from any one phase to another. All in all, excellent news for California and the rest of the country – the study provides strong evidence that tackling climate disruption will not necessarily harm the economy, and may in fact provide both an overall economic boost and significant numbers of new jobs. President Bush has been fighting regulations protecting endangered species and restricting carbon emissions for years, and he’s been trying to write new rules in the waning days of his administration that have the potential to seriously impact endangered species protections for years to come. Now a memo has been leaked to the media that shows the Interior Department’s top lawyer essentially claiming that, since damage from a particular carbon dioxide source (CO2) can’t be proven to cause specific damage to a species or habitat, CO2 emissions need not be considered by government regulators. This legal argument has the potential to, with an executive rules change that doesn’t get directly reviewed by Congress, gut the Supreme Court decision that concluded the EPA had the authority and requirement to regulate CO2 emissions. At the same time, the related rules changes would permit the various government agencies to decide without the help of outside experts whether or not a project would “harm wildlife”. According to Jamie Rappaport Clark, former director of the Fish and Wildlife Service during the Clinton administration, “the bigger issue was conflict of interest,” namely that the Pentagon or Bureau of Land Management would be permitted to decide for themselves whether a new military installation or mine would harm wildlife. I think it’s fair to say that, if these new rules go into effect, that they’ll either be immediately reversed or be litigated by environmental groups until the next Administration is forced to change them. 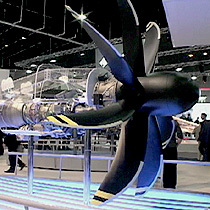 Propeller engines are more efficient than the standard turbofan and turbojet engines that most commercial airliners use today. They haven’t been used since the invention of the turbofan because of the noise and relatively inefficient propeller designs. But the recent push for fuel and carbon efficient air transportation may bring propeller aircraft back into vogue. Especially if the new Rolls-Royce engine pans out. It’s up to 30% more fuel efficient than comparable turbofans for similarly sized aircraft, and that could mean millions of dollars in fuel savings per aircraft equipped with propellers instead of turbofans. The Environment Report last week reported that companies as varied as WalMart, HP, and Haworth office furniture are focusing on reducing packaging and fuel savings as a way to reduce CO2 emissions. According to the article, instead of buying large cardboard boxes and Styrofoam blocks for shipping furniture, Haworth paired with Perkins Specialized Transportation in developing a way to ship office furniture wrapped in reusable padded blankets. Similarly, HP stopped shipping their laptops to WalMart in a shipping container (again cardboard and Styrofoam), saving space and mass on trucks. This enabled WalMart to cut down on the number of shipments and reduce the amount of fuel consumed, saving money in multiple places. Reader Roundtable: what's the greatest technology of all time? I’d forgotten about those open-rotor props. Thanks for the update. Also, even though I’m (ahem) a geologist by undergrad degree, I’m curious how the Larsen C would be studied. What kind of data would be collected? And how? According to this British Antarctic Survey document, it’s actually three different expeditions during the 08/09 season that are looking for instability, uplift, the effects of the glaciers feeding into the shelf, etc. They’re going to be drilling and using radar as well as measuring tidal effects, but that’s all I’ve been able to dig up. You could contact the BAS or the University of Newcastle/University of Edinburgh scientists for more information, though. You and my wife would get along famously, I think. She’s a University of Utah grad with a love of paleontology (trilobites specifically) and volcanism. Efficiency, efficiency, efficiency…and then you take it to the next step and design processes where the waste from one is the feedstock for another. Some people call it nature. Though i find the Amory/Lovins combination to get a little carried away with flights of utopian fancy, i think that their idea of “natural capitalism” is the overarching philosophy we need to work towards. Basically all of man’s technology is an imitation of nature, yet we don’t seem to have ever bothered with imitating how nature does things…only what she does. It has left us in a situation where our imitation falls terribly short in a very important regard: waste. The one thing nature never does is waste anything. That’s pretty neat about the open props, and i hate the Bush administration so much that it doesn’t even feel good in a “let the anger flow through you” kind of way.